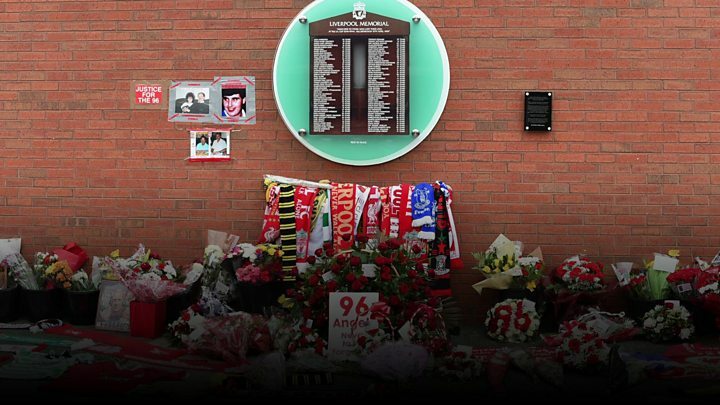 The jury at the Hillsborough inquests had to answer 14 questions in deciding how 96 people died. The deaths followed a fatal crush on the terraces involving Liverpool fans at the 1989 FA Cup semi-final. Jurors were given 96 individual questionnaires about each person who died. 1. 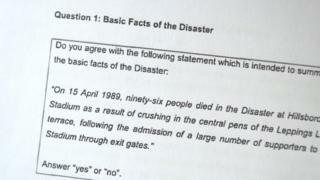 Basic facts of the disaster: Do you agree with the following statement: "Ninety-six people died as a result of the disaster at the Hillsborough stadium on 15 April 1989 due to crushing in the central pens of the Leppings Lane terrace, following the admission of a large number of supporters to the stadium through exit gates." 2. Police planning for the semi-final match: Was there any error or omission in police planning or preparation which caused or contributed to the dangerous situation that developed on the day of the match? "We feel there were major omissions in the 1989 operational order". 3. Policing of the match and the situation at the turnstiles: Was there any error or omission in policing on the day of the match which caused or contributed to a dangerous situation developing at the Leppings Lane turnstiles? "The police response to the increasing crowd at Leppings Lane was slow and uncoordinated. "The road closure and sweep of fans exacerbated the situation. No filter cordons were place in Leppings Lane. No contingency plans were made for the sudden arrival of a large number of fans. "Attempts to close the perimeter gates were made too late". 4. Policing of the match and the crush on the terrace: Was there any error or omission by commanding officers which caused or contributed to the crush on the terrace? "Commanding officers should have ordered the closing of the central tunnel". 5. The opening of the gates: When the order was given to open the exit gates at the Leppings Lane end of the stadium was there any error or omission by the commanding officers in the control box which caused or contributed to the crush on the terrace? "Commanding officers did not inform officers in the inner concourse prior to the opening of Gate C.
"Commanding officers failed to consider where fans would go. "Commanding officers failed to order the closure of the central tunnel prior to the opening of Gate C". Finally, the jury must be sure that the breach which caused the deaths amounted to "gross negligence." 7. Behaviour of the supporters: Was there any behaviour on the part of the football supporters which caused or contributed to the dangerous situation at the Leppings Lane turnstiles? 8. Defects in Hillsborough stadium: Were there any features of its design, construction and layout which were dangerous or defective and which probably or may have caused or contributed to the disaster? "The design and layout of the crush barriers in P 3 and 4 were not fully compliant with the green guide. "The removal of barrier 144 and the partial removal of barrier 136 would have exacerbated the waterfall effect of pressure towards the front of the pens. "The lack of dedicated turnstiles for individual pens meant that capacities could not be monitored. "There were too few turnstiles for a capacity crowd. "Signage to the side pens was inadequate". 9. Licensing and oversight of the stadium: Was there any error or omission in the safety certification and oversight of Hillsborough Stadium that caused or contributed to the disaster? "The safety certificate was never amended to reflect changes to the Leppings Lane end of the stadium. Therefore capacity figures were not updated". 10. Conduct of Sheffield Wednesday FC before the day of the match: Was there any error or omission by SWFC and its staff in the management of the stadium and/or preparation for the semi final match on 15 April 1989 which caused or contributed to the dangerous situation which developed on the day of the match? "The club did not approve the plans for dedicated turnstiles for each pen. "The club did not agree any contingency plans with the police. "There was inadequate signage and inadequate and misleading information on the tickets". 11. Conduct of Sheffield Wednesday FC on the day of the match: Was there any error or omission by SWFC and its staff on 15 April 1989 which caused or contributed to the dangerous situation that developed at the Leppings Lane turnstiles and in the west terrace? 11a If "no", was there any error or omission by SWFC and its staff on 15 April 1989 which may have caused or contributed to the dangerous situation that developed at the Leppings Lane turnstiles and in the west terrace? "Club officials were aware of a huge number of fans still outside at 14:40. They should have requested a delay in kick off. 12. Conduct of Eastwood and Partners (SWFC engineers): Should they have done more to detect and advise on any unsafe or unsatisfactory features of the stadium which caused or contributed to the disaster? Eastwood and Partners did not make their own calculations when they became consulstants for SWFC, therefore the initial capacity figures and all subsequent calculations were incorrect. Eastwood and Partners failed to recalculate capacity figures each time changes were made to the terraces. Eastwood and Partners failed to update the safety certificate after 1986. 13. Emergency response and the role of South Yorkshire Police: After the crush in the West Terrace had begun to develop was there any error or omission by the police which caused or contributed to the loss of lives in the disaster? "The police delayed declaring a major incident so appropriate emergency response was delayed." 14. Emergency response and the role of South Yorkshire Metropolitan Ambulance Service (SYMAS): After the crush in the west terrace had begun to develop, was there any error or omission by the ambulance service SYMAS which caused or contributed to the loss of lives in the disaster? "They failed to ascertain the nature of the problem at Leppings Lane. "The failure to recognise and call a major incident led to delays in responding to the emergency."